Thanks for all the kind words after my last post — so many of you reached out, mostly to express your sheer amusement at our box truck situation. Ha! Yes, it was amusing. Hopefully our car will return to us later this week with a functioning engine!! TBD. We’re doing just fine without a car, so it’s not really an issue. You know what is an issue? My (in)ability to make hashbrowns. They’re something I’ve never been good at, and haven’t taken the time to master. Enter: Dr. Praeger’s Hashbrowns. They’re so darn easy! I just pop them in the oven (for a bit longer than the directions say — I want them crispy! ), prepare my other breakfast components, and by the time I’m ready, my hashbrowns are done and perfect. 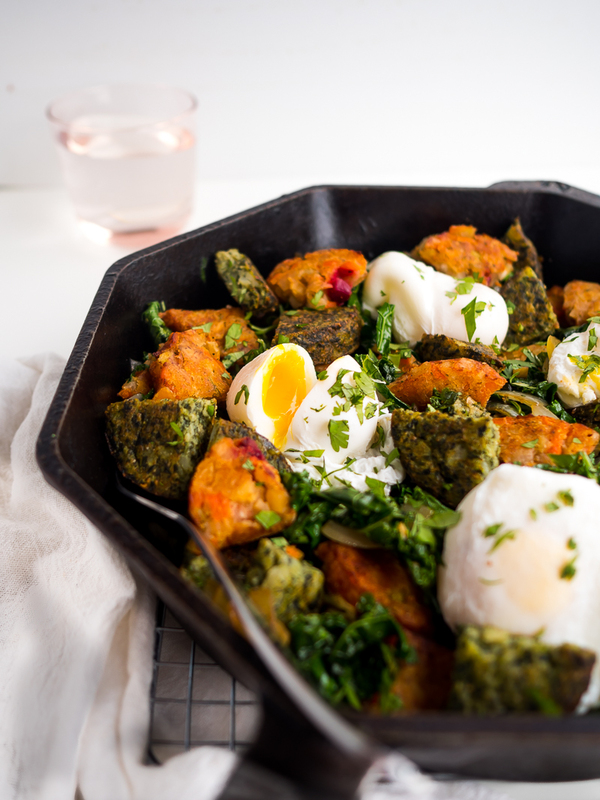 AND, I used root veggie hashbrowns in this recipe — you know I love to eat more veggies when I can!!! Winter is most definitely coming in Portland. It’s cool (even cold?) in the mornings, much rainier, and all of a sudden I’m in the mood for all foods WARM, hearty, and comforting. Soup? Yes. Every night (with some breaks for pasta). Breakfast? HOT EGGS AND POTATOES! 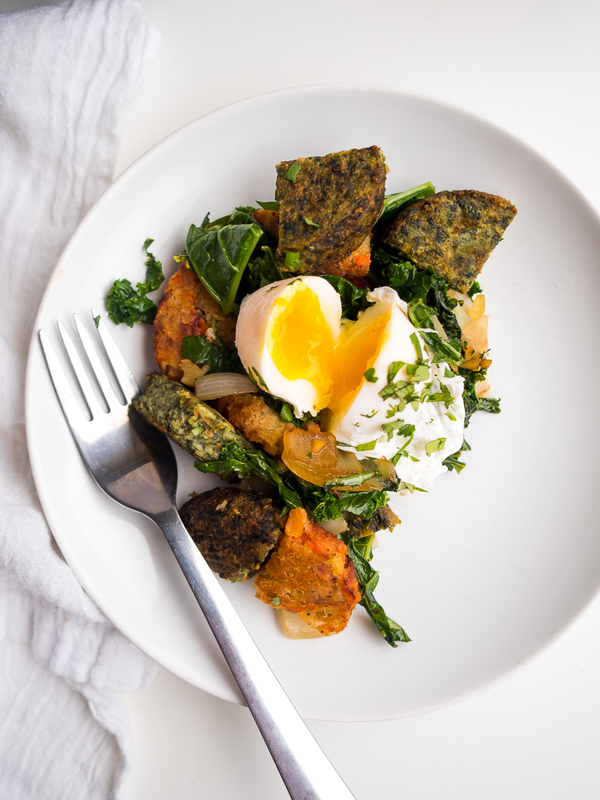 For this recipe I really wanted to use hashbrowns (as we discussed) AND some vegetable cakes. 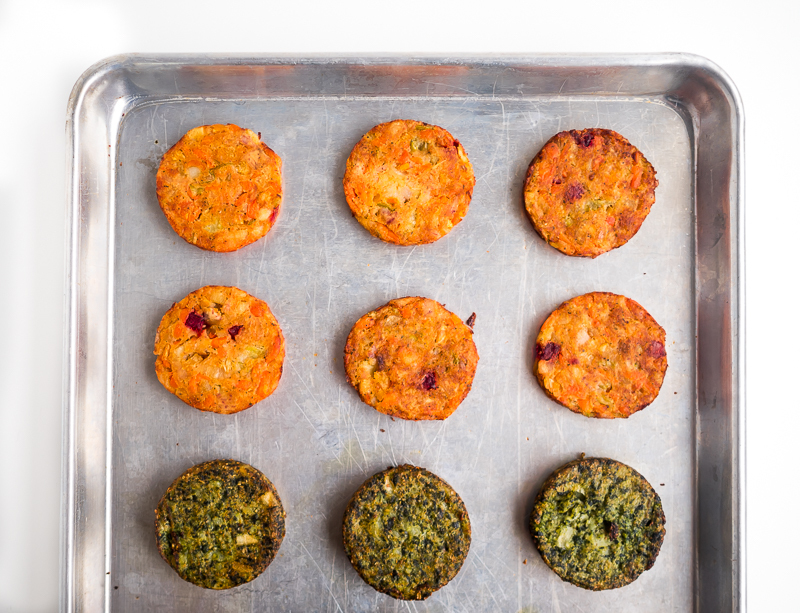 I chose Dr. Praeger’s Spinach Cakes, because I love greens. You know this. Fair warning: these things are unbelievably addictive. 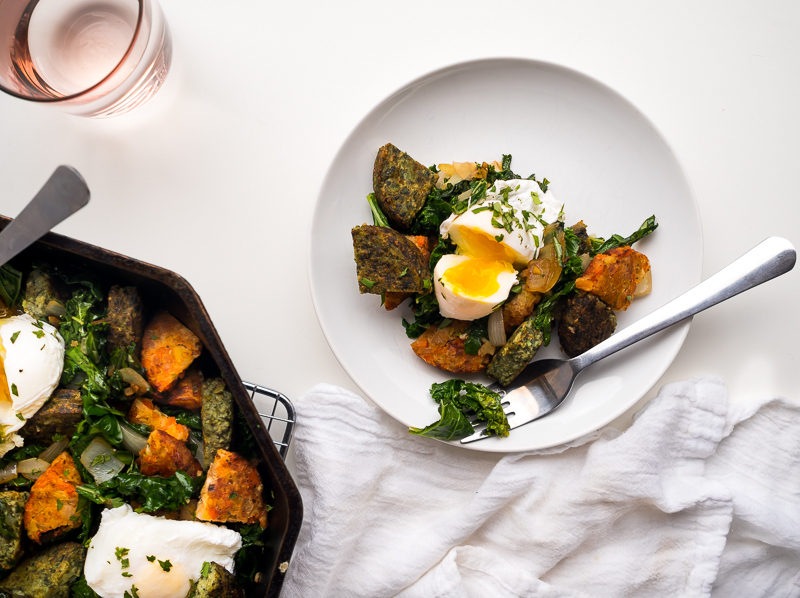 They’re made out of potatoes, spinach, and onions — and don’t have any weird ingredients — and if I said I’ve never had a meal of just these straight out of the oven: I would be lying. 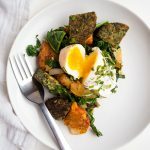 This recipe is quick and simple: start your hashbrowns and cakes cooking in the oven, get your hash going on the stove with onions, garlic, and some more greens (I used kale!). At this point, you can either poach a few eggs, or fry a few eggs. When the stuff baking is done, cut them up, throw them in the hash, and top with eggs! Easy. 20 minutes. Delicious/nutritious breakfast! Now that I’m typing this I can’t help but think I totally missed an opportunity to slather on some delicious sauce, or top with avocado. DO AS I SAY, NOT AS I DO! Get something delicious on top of this. What are your go-to recipe as fall sets in and winter approaches? Anything I need to try? 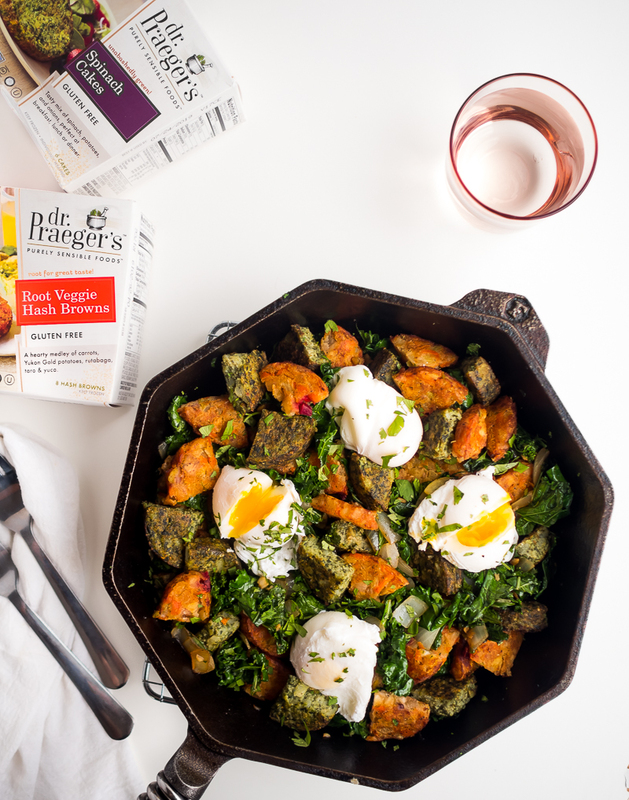 This easy breakfast hash has root vegetables, greens, and eggs. It comes together quickly with the help of frozen hashbrowns, and delivers a nutritional punch! *I find I need to cook the hashbrowns and cakes about an extra 5-7 minutes to get them really crispy and set around the edges.